Glass of Fancy » Blog Archive » Updates from Inside the Igloo - Fashion, fiction, and life in the city. As anyone who’s been watching the news in the US probably knows, we’ve been having some weather around here. Specifically, snow. Upward of six feet of snow, with more on the way. We’ve broken the 20 day snow record, we’ve broken the 30 and 40 day snow records, all that we have left is the snowiest winter record, and hey, there’s still a month of winter to go. None of this snow has melted. It lines every street, every sidewalk, in banks higher than my head. I cannot express to you how unrelievedly snowy it is here right now. It’s been challenging to get groceries in for the last three weeks, with the result that when I heard that this month’s Let’s Lunch theme was noodles, my mind took it somewhere other than comfort food. I don’t even want to contemplate how much starch out of the cabinets I’ve eaten lately! Instead, I offer you salad, as antidote to winter. Okay, I know I am not actually going to get scurvy (I know this because of the lifesaving citrus-y sidecar I had at the cocktail hour last night), but the psychological pressure of all this snow is starting to make having something fresh and green seem like an emergency. Also, I have a new peeler. It came in a set which I bought because they were pretty colors (this is how all my kitchen equipment happens), and it peels vegetables into lovely julienne. Who doesn’t want to play with that? If you’re in the northeast, try this bright, lemony salad during Sunday’s snowstorm and remind yourself: summer will come again. Eventually. Whisk salad dressing together; toss vegetables with dressing and serve immediately. Serves four as a salad course. Lokshen Kugel at Monday Morning Cooking Club. Gingery Chicken & Bok Choy Noodle Soup from Cheryl Lu-Lien Tan. Ramen with Bacon Southern Style at Sweet Savant. Grilled Tofu Spicy Peanut Noodle Salad at J Loh. Thai Glass Noodle Salad at Insatiable Munchies. Chicken Noodle Soup with Roast Barbecue at Asian in America. Biang Biang Noodles at the Gastrognome. Korean Stir-Fried Glass Noodles (Japchae) at the Asian Grandmother’s Cookbook. Marinara Chicken at Wok Star. This entry was posted on Friday, February 13th, 2015 at 7:43 am	and is filed under Manna. You can follow any responses to this entry through the RSS 2.0 feed. You can leave a response, or trackback from your own site. 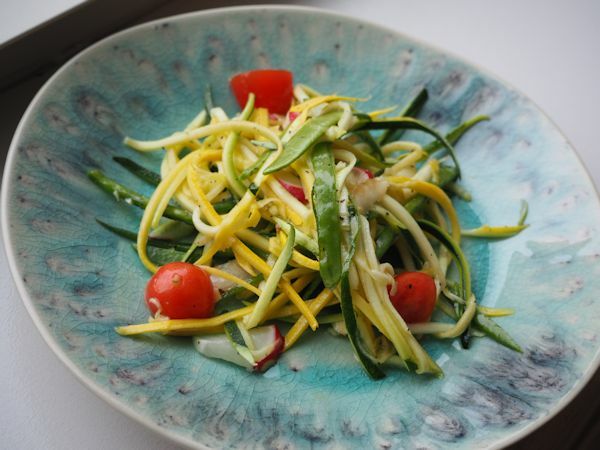 I’ve been searching for zucchini or squash noodle recipes and this is perfect. I love the simple dressing you added and will definitely make this soon. Hope all is okay in your snowy corner. Thanks for the blog visit and glad to do Let’s Lunch with you! That’s an adjustment of a dressing my sister-in-law got from a farm share one year; I’m very fond of it as a good basic dressing for salads. I bought a julienne vegetable peeler and it has quickly become one of my favorite kitchen gadgets. I love the way it makes long slender carrot “noodles”. Stay warm and keep the scurvy away with more Side Cars! I had no idea what that one did until last week; I foresee a great many fancy vegetable garnishes ahead! Looks lovely and refreshing! what is your new peeler? The julienne looks just right. It’s the OXO julienne peeler; I got it as part of a set but it’s sold separately also. What a pretty plate! I’m going to have to try this. Stay warm!! It’s getting comical out there. At this point, all you can do is laugh! Annabelle, I love your faux noodles!! This looks like the perfect dish for Sydney right now where (I’m sorry to report to you) it is hot and humid every single day. I hope your weather starts to improve soon…my son was in Boston last week for only 1 day to visit Harvard and it was closed because of the snowstorm! Oh, no! What bad timing. Although as I recall, it poured rain for my entire college pre-frosh weekend and somehow that did not change my mind about where I was going to go. One of my local friends is asking everyone she knows with ties to England to send available children through the wardrobe to deal with our obvious white witch problem. Seems like as reasonable a response as any!